House inspections performed for the buyer to uncover any defects, repairs and safety issues with the home. The buyer will usually sign a contingency agreement with the seller prior to ordering this type of inspection. The inspection report will help both the buyer and seller identify items needing repaired or replaced so that both parties can either renegotiate the selling price or the seller's responsibilities to repair the property at the seller's expense prior to the final close. Even if the seller has previously performed a Seller's Inspection, a buyer should still perform their own unbiased inspections. House inspections performed usually from 1-3 months prior to the expiration of your Tarrion home warranty. It is used to take advantage of the features and benefits of your home warranty to assure that necessary repairs guaranteed under your warranty are executed should repairs or damage be discovered. This is a level 1 visual inspection of any wood burning appliance. This is usually recommended by the insurance company to verify that the wood burning appliance is safe to use. In the event of any defects found then a level 2 or level 3 inspection may be required. This is a visual inspection of a room or an entire home, with the use of moisture meters and thermal imaging - Additional Cost for aid of Certified Mould Detection Canine - Super Sniffer (Jersey). These type of house inspections are performed prior to engaging in any renovations of a property. These inspections help you to assess potential problems that may affect the cost or difficulty of the renovation and adds the assurance of quality control as the work progresses. These type of house inspections are most-often used when a homeowner feels that a problem may exist. For example, after unusually severe weather, if you experience an odd smell in your home that cannot be identified, or if you notice unusual pest and insect activity. In many cases, Investigative Inspections can help homeowners to catch problems before they become an expensive or irreversible liability. This is a basic house inspection of one area of concern in the home. Example: plumbing, electrical, roof, etc. This can be used to problem solve any concern and repair or replace any defects found when they are in the beginning stage. This can prevent things that are small from becoming an enormous expense. For example: a small crack in the foundation can be easily fixed if dealt with in the early stages, later the crack could widen and possibly cause structural failure. An inspection for the seller before the property is listed for sale used as a great marketing tool. This determines what defects, safety issues, etc exist with the property. The report presents the seller with the needed information to ether repair or replaces any needed items prior to listing the property. By either repairing / replacing or disclosing any problems found can be used to determine fair market value, discount values, or any pre-listing expenditure necessary to increase the value and desirability of the property. This is similar to a pre-listing inspection except that a second inspection can be performed and the report updated with any changes made on the first inspection. The report will be hosted by www.FetchReport.com. 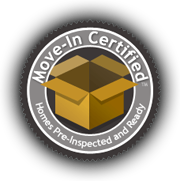 Potential buyers can view the report by simply typing in your address at www.moveincertified.com. A Move-in Certified sign for your lawn can be provided as a great marketing tool. House inspections usually performed every two years to assure the health of your family and the safety of your real estate investment. Periodic The Maintenance Inspections is necessary to assure the integrity of your structure in-between storms, floods and droughts, to identify possible indoor pollutants (such as Mould, CO, CO2 and radon), to check the building's integrity that may compromised by cracked beams or foundations, to visually inspect for wood-destroying insects, and more. Any these situations can contribute to decrease home value or pose a physical risk to your family if not identified in time. * * * Remember you are not only getting a inspector who has been performing home inspections since 1997, you are also getting 30 plus years of renovation expertise, a Carson Dunlop graduate, 15 plus years plus as a real estate investor, a technical teacher and a mentor to student inspectors.